It’s day number…. something? 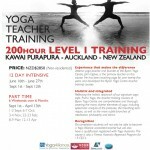 on my Prana Flow teacher training with Shiva Rea. The training is at Exhale Spa, Venice, California and the apartment I’m staying in with another student is a short walk along Venice Beach. Ah Venice Beach… like no other I’ve ever encountered. Shops and cafes on one side… a wide pavement of walkers, bikers, rollarbladers & skaters, dogs and skateboards in the middle… and vendors, musicians, and hanger-ons on the other side. Beyond the vendors lies at least two rugby field lengths of flat sand before the waves finally start. The first time I walked Venice Beach, I was with two other students, coming back from an afternoon training session. It was nearing the end of a 36 hour day for me. I’d stepped off the plane at 6:30am LA time that morning, which was 2:30am Kiwi time, and after two hour nap on the couch headed straight into the afternoon session of Fluid Power Prana Flow teacher training. After my two days of visa & passport ‘yoga practice’ in Auckland, an all-night 12 hour flight, a strange country, walking into a training everyone else was a day and a half into… I was in state of discomfort. Still finding my grounding. Figuring out who I was in relation to everything around me. Watching the landmarks, the customs, the dialogues so I knew what to do when. That walk fascinated me – even in my state of discomfort I wanted to stop and take in the sights, the feelings, the sensation of being in a post-apocalyptic world like Mad Max or The Fifth Element. There’s something going on down at Venice Beach that speaks to the way that our world is going to evolve and change in the coming decades, as we come to terms with limited resources and a finite place to dump our garbage. It got me excited. But walking with two other students, still unsure of my own grounding, I was following their flow, rather than honouring my own. Today I got an opportunity to walk Venice Beach alone, giving me the opportunity to listen to my own now-grounded sense of flow, rather than attempt to fit in with the flow of those around me. Honouring that individual flow has been a big part of our learning – the notion that yoga is there to balance us, to speak to our own individual needs, whatever they might be. That yoga is about honour our divine intelligence which guides us through every asana, every movement, every mudra and every pranayama. In this afternoon’s session, Shiva taught a fire practice divided into four sub groups – depending on what aspect of the other elements we wanted to work with, we chose a way to approach Fire. There were the Earth Fires, who stoked the fire within from a steady place of solidity. Air Fires who worshipped the fire from their hearts. Water Fires who find the creative fluidity to support their heat and the Fire Fires who went with total commitment into the burn. In this way, Shiva’s Fire class catered individually to our needs – we choose where to go, and we intuitively modified the Fire with the understanding of our element. Naturally a Fire Fire kind of gal, I went with Water Fire, finding the fluidity within the power. I was still feeling that flow under the fire as I cruised down the beach. A night or two before I left Dunedin to come on this training, I had a particularly potent dream that included the Predator from the movie series. It’s an image that’s stuck with me as I’ve been working through it’s significance over the last week. 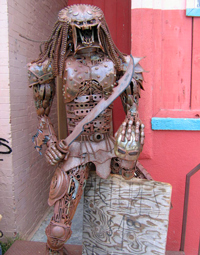 Walking the beach, I was astounded (yet not) to come across a ten foot tall recycled copper sculpture of the Predator standing on the sidewalk. Understandings and insights dropped into place . I wanted to stand in front of that sculpture, bow my head, and pay homage to the Destroyer within each of us – the Predator that lives inside and seeks to devour all that lies before it. So I did, making an offering to the bowl in front of the statue and standing for a moment, hands in anjali mudra at my third eye before continuing on down the beach. It was a mystical heartbeat moment of the kind that are suffusing this entire experience. Immersed in a like-souled community with Shiva and the other teachers and exploring the mystical and spiritual nature of our beings that completely infuses this yoga and these teachings has been heart-affirming. It’s just real nice to hang out with folk who understand the deeper layers of life, who work with energy, who understand the subtle body, who honour themselves and those around them with love and light, laughter and realness. It’s helped me make peace with my own divine and mystical nature in such a way that I’m comfortable expressing that in public – like bowing to a Predator God on Venice Beach. Between the Predator God and my apartment, I stopped twice. Actually, I stopped once, and was stopped the second time. The first time I was drawn to simple pendants carved from driftwood. I stopped to look, and as is usually the case with buying from vendors around the world, listened to the story of the art. The artist, a man who’d seen Jimi Hendrix play to a more-than-half empty concert in Germany in 1968, showed me the hand-sized pieces of wood that he found up and down the beach. They just look ordinary, like nothing special, but you never know what’s going to be in them under you start to work with them. A potent reminder of the nature of most people, until they begin to do the work of excavating their true self, the heart that lies beneath. The second time, I flowed right to avoid a skateboarder, he looked at me, darted to a stall behind us and called me over. I hesitated for a moment – that instinctual rejection of the world’s offering because what if? – but caught myself and went to see. Ah… while the first stall was a craft, this jewelery on offer was art. Not that one is better than the other, just that there is a different energetic imprint between wearing a piece that’s crafted, and wearing a piece that’s art. Ramiro Perez had the eyes of a mystic, and spoke with the cadence of a machine gun. Listening – truly listening – to what he had to offer was like standing under a waterfall with an open mouth. After all the work we’d been doing on elements, I wanted to somehow pull his verbal brilliance back down to the earth and ask him to take a moment of silence, of pause, of breath and feel the earth’s heartbeat before continuing on with his machine-gun wisdom. But in that moment nothing could stop his hail of words, so instead, I held my ground and let his words rain over me, soaking in the essential, discarding the unnecessary. And it was well worth the effort – ‘cos mindful, present listening does take effort, especially when the speaker is throwing out pearls of wisdom in every sentence. Ramiro works in the discard of a material, consumerist society, breathing life back into it’s parts, creating new wholes. Each of his pieces was stand alone, organic, birthed from within. No mass market appeal here, instead jewelery that calls to the soul. I feel in love with a necklace – twisted copper cocooning a piece of quartz – but didn’t have enough cash on me to buy it. Yet as I stood and listened to Ramiro talk, it felt like the gift of the moment wasn’t in buying something, it was in the information being transmitted back and forth, both by words and also energetically. Listening, I picked up a lone naked crystal from the table, the only one adrift amongst a sea of ornate, mixed-media necklaces, bracelets and rings. It was a gift to me, so now it’s a gift to you. It was a gift I was grateful for in that moment of machine-gun listening – Kyanite. One of the only crystals that never needs cleansing, and excellent for helping one with clarity of communication, both in listening and speaking. A reminder that in every moment, we are supported with what we need – when we can honour our own individual flow and receive what is offered. The discomfort and fear I’d felt walking the beach the first time, trapped in the flow of others because I was unsure and didn’t want to stand out, had blocked these experiences from happening. There’s no openness, nor receptivity in fear, or in conformity. Stuck in my head that first walk, I hadn’t noticed the 10 foot high copper sculpture of the Alien/Predator so had missed the opportunity to integrate the understandings of my dream. Acquiescing to the lead of others, I hadn’t followed my own impulse to explore the stalls and connect to the vendors, and so had missed the opportunity to hear tales of Jimi Hendrix and receive gifts of crystals. Of course this didn’t matter. It wasn’t like I ‘failed’ that first walk. Opportunity doesn’t knock just once, no matter what you may have been told. We don’t live in a linear world, but a world of spiral. Drop the ball this time around, and there will be another chance. And when that second, or third, or fourth chance comes back around, you will have changed and this time may see the opportunity, or be ready to receive it. We can all feel the internal pull towards our truth, it tugs at our heart and swirls in our belly. As each one of us finally takes that dive, having the courage to follow our own flow, expressing ourselves in the way that most honours who we are, our world will change. It’s that change I can see down on Venice Beach, where craftsmen and artists ply their wares opposite chainstores and corporates, daring to do what they love with whatever’s available to them in that moment – driftwood, copper, the insides of old typewriters. It’s a change I want to embody as I come back to New Zealand, honouring the eddies of my own heart, opening to receive whatever is on offer in the moment. That’s Fluid Power. That’s Prana Flow. That’s… just yoga really.